Volume and tone controls, in their simplest form, use potentiometers and capacitors. Potentiometers, more commonly referred to as pots, are variable resistors with three terminals – a circular or linear resistive carbon track with a terminal at each end and a third terminal connected to a moving ‘wiping’ contact which travels along the resistive track. The three terminals are positioned so that the centre terminal is connected to the wiping contact. Pots are manufactured in a wide range of power ratings but as the power generated by a typical passive pickup is so low (i.e. millivolts generating milliwatts), pots rated at 0.25 Watts are quite acceptable for this situation. The Centronics pots shown below, as used in some DeArmond transducer pickups, are rated at 0.1 Watts. The CTS pot shown above has a 1/4”(6.35mm.) dia. split splined shaft and solderable terminals. Plain finish, where the control knob is secured with either a grubscrew or glue, as used with the first versions of the clear cylindrical knobs supplied with the early Rhythm Chief pickups Models 1000 and 1100. Removing these glued knobs can be quite difficult, however. The later version of this knob was fitted with a grubscrew. Splined or knurled finish, where the shaft has parallel grooves running along the shaft. There are two versions – Coarse (18 splines or grooves) and Fine (24 splines). This option eliminates any ‘slip’ rotation of the control knob. If a knob with a grubscrew is fitted on a pot’s split shaft, the grubscrew must be positioned so that the screw presses on the split in the shaft. Otherwise, screw pressure will bend and ultimately break off the end of the shaft. The drawing above shows a CTS manufacture pot (from a current catalog) as viewed from above. With the knob rotated fully CCW (Counterclockwise), the wiper is directly connected to Terminal 1 and when the knob is rotated fully CW, the wiper is directly connected to Terminal 3. The drawing above shows a side view of the same pot. The shaft is shown as 0.25″ dia., plain. The bushing referred to is available in a choice of lengths and in this case, it’s thread is shown as 3/8-32NEF. A Les Paul guitar requires a longer shaft than a Stratocaster, hence the length options. Wiper rotation is 300 degrees, common to most pots of this type. (CTS Technical data above by kind permission of CTS Corporation). Pot manufacturers supplying DeArmond included Allen-Bradley, CTS (Chicago Telephone Supply), CRL (Centralab) and Stackpole. Allen-Bradley pots were used on some DeArmond foot-operated volume controllers such as Models 600 and 602. These pots were built to withstand the mechanical stress involved in such an application. Stackpole pots were fitted in the Model 600 pedal. Because of their compact size, Centralab pots were fitted in the pickup Models 700, 750-C and 800 (Spanish guitar transducer). Two extracts from Centralab catalog above. Two views above of a 1K pot, 1st version, showing the three terminals and two fixing studs (B0541). Two similar views above of the 2nd version. The above chart by Centralab from the 1940s shows the wide range of curves then available. Curves Nos. 3 or No. 6 would be suitable for a volume controller, with a slow initial rise. 1. ‘Stacked’ or twin-gang pots, as in the Dual Volume Pedal 1620. This pedal takes two jack-plug inputs through two electrically separate identical volume pots mounted on a common shaft, working in tandem with two jack-plug outputs. 2. Stereo Volume Pedal 1622, using two electrically separate identical volume pots mounted on a common shaft. One pot controls the Left channel and the other controls the Right channel, with two stereo jacks, one an L & R input and the other an L & R output. 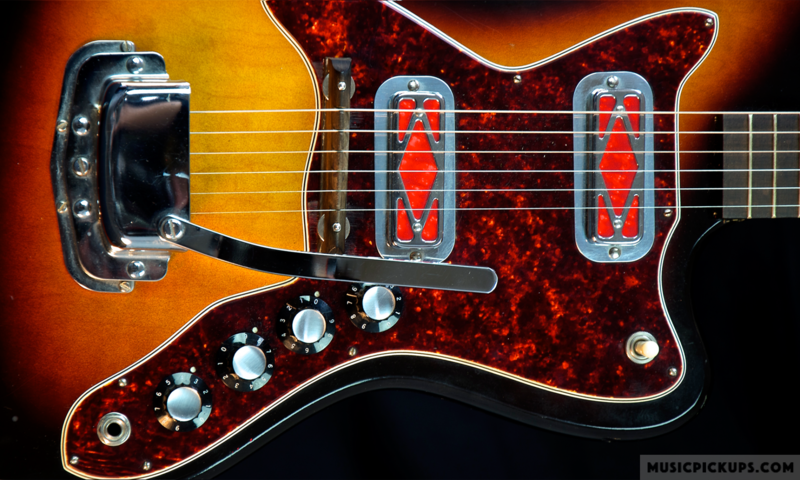 A twin gang pot with two different resistance values is used as the tone controller in the Model 610 Combination Volume and Tone Control pedal. ‘A passive semiconductor with two plates, each connected to a terminal. When charged, the plates can store energy in an electric field’. The SI unit of electrical capacitance is the Farad. The value of the capacitor in the controls box for the DeArmond Model 40 pickup shown is 0.1 microFarads, generally written as 0.1 μF +/- 10%. It is also rated at 100 Volts. The +/- 10% Tolerance figure is the manufacturer’s stated maximum variation from the stated value (see below for more information on tolerance). If a DC voltage is applied to a capacitor, current will flow for a short period only, dropping gradually to zero, as the capacitor reaches full charge. If it’s two terminals are shorted, the capacitor will discharge immediately. If an alternating voltage is applied to a capacitor, a current will flow. The Impedance (or resistance in an AC circuit) is not the same as resistance because as the frequency in an AC voltage changes, so the impedance changes also. The impedance is inversely proportional to the frequency, thus allowing higher frequencies to pass through more easily. Above, a V & T controls box (version 2) for a DeArmond Model 40, Model 41 and Model 56 pickups. The volume controller is on the RHS. The pickup’s Ground conductor (screen) is soldered to the lower of the three terminals and the pot case. The pickup’s Hot input conductor (black) is soldered to the top terminal. The Hot output conductor from the from the wiper (white) is soldered to the minijack socket’s Hot terminal, and looped to the bottom terminal. The capacitor is connected between the Volume controller’s top terminal (Hot input conductor and the middle (wiper) terminal on the tone pot (LHS). The tone pot’s top terminal is soldered to the pot’s case, earthing it. Connecting a capacitor in parallel with a pickup’s output will reduce or Attenuate the lower frequencies. Connecting a capacitor in series will Attenuate the upper frequencies, as those high notes are now shorted back to the pickup. The information on both pots is the same in this particular example – each pot being numbered 1376639 (137 for CTS, year 1966, week 39) and R20. One pot’s resistance was measured at 226KΩ, supplied as 250KΩ +/- 10%. The ‘R20’ stamped on the pots refers most likely to the resistance and slope of the pot. The ‘+/- 10%’ above refers to the Tolerance or variation from the stated value of the item. See the CTS and Allen-Bradley technical data sheets below for more technical information. CTS Series 450G Data Sheet for their Pots as available 2017. CTS data above by kind permission of CTS Corp.
Allen-Bradley products obsolescence and alternative suppliers info. Allen Bradley data above by kind permission of Farnell & Allen-Bradley.